Valves are essential to industries which constitute the backbone of the modern world. The prevalence of valves in engineering, mechanics, and science demands that each individual valve performs to a certain standard. Just as the valve itself is a key component of a larger system, the valve actuator is as important to the valve as the valve is to the industry in which it functions. Actuators are powered mechanisms that position valves between open and closed states. Pneumatic rack and pinion actuators utilize air pressure as the motive force which changes the position of a valve. A rack and pinion actuator is comprised of two opposing pistons, each with its own gear (referred to as the "rack"). The two piston racks are set against a round pinion gear. As pressure increases against one side of each piston, each rack moves linearly against the opposite sides of the pinion gear causing rotational movement. This rotational movement is used to open and close a valve. See the animation above (provided by Wikipedia) below for a visual understanding. This short video introduces the basic parts and operation of rack and pinion valve actuators to anyone unfamiliar with the device. Visit http://www.swansonflo.com to learn more about industrial valves, valve actuators, and valve automation. 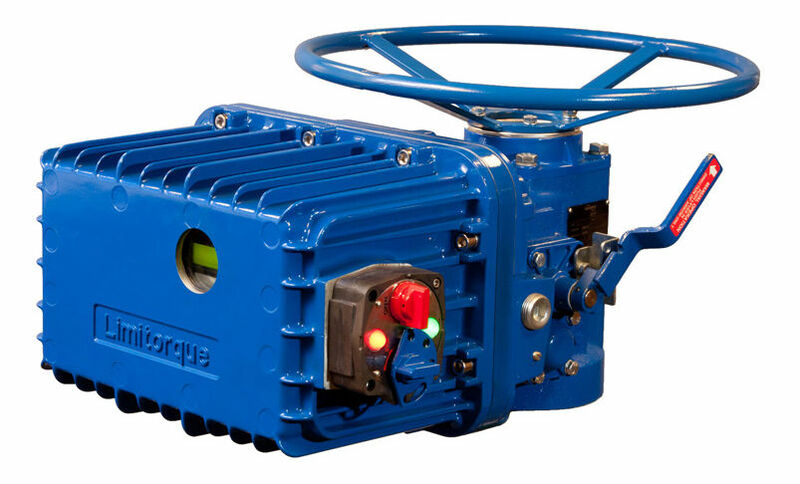 Whether used with gate valves, globe valves, penstocks or sluice gates, versatile Limitorque L120 Series actuators operate without modification in any rising or non-rising stem application for linear-action valves. When combined with a Limitorque WG or HBC series quarter-turn gear operator, L120 actuators can also be used to control butterfly, ball and plug valves, as well as damper drives, flop gates or any other device which requires rotary movement. L120 actuators are specified for use in petrochemical, power generation, and water and waste treatment applications where failure of a single actuator can be extremely costly … even catastrophic. For more information on Limitorque actuators, visit Swanson Flo's website or call 800-288-7926. For your convenience, below you will find the Limitorque L120-85 installation and operation manual. What are purged impulse lines and why are they needed? Diagram of a purged impulse line implementation. Purged impulse lines, or sensing lines, allow process transmitters and gauges to maintain operation under potentially adverse process conditions that may impact the operation or accuracy of the instrument. The purging of an impulse line is of particular use when sensing lines may have a high susceptibility to plugging by the process fluid. The line is purged with clean fluid at a constant rate, meaning new fluid is always being introduced into the impulse line. When the purge is properly set, a critical element of successful implementation, the pressure instrument is still able to correctly measure system pressure. Purging a sensing line will require additional valves and devices to properly control the purge fluid flow and provide for effective maintenance or repair. Because of the increased relative complexity, a purging setup will likely be employed only in cases where other methods of maintaining clear sensor lines and proper instrument operation have been considered and rejected. The impulse line will stay free of sedimentation thanks to the purge fluid, and process fluid contamination of the sensing line is avoided. One of the most important parts of the purged impulse line system is a restriction, implemented to prevent the pressure instrumentation from sensing the elevated pressure of the purge fluid supply instead of measuring the original process fluid. The purge valve, through which the purge fluid flows, is left partially open instead of fully open. If the restriction does not mitigate the introduction of the purge fluid on the process line, then the flow rate of the purge fluid can adversely impact the process measurement. 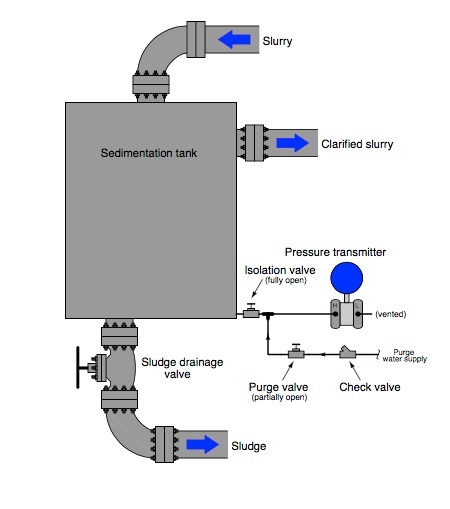 It is essential that purge flow be regulated in a manner that does not adversely impact the measurement of actual process conditions. A basic requirement of sensing line purge systems is that the supply of purge fluid needs to be flowing at all times. 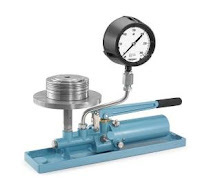 Additionally, the purge fluid supply pressure must be maintained at a level greater than the process pressure because if the pressure of the purge fluid supply drops below the process pressure, the process fluid will flow into the impulse line. The purge fluid must also not react negatively with or contaminate the process and will be continuously consumed. Generally, purge rates are kept as low as possible, mitigating purge fluid impact on the process measurement and keeping the cost low. 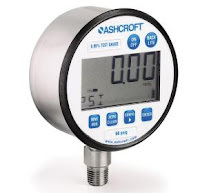 A rotameter, which indicates visual flow of the purge fluid, is an item typically paired with purge impulse line systems, and there are many options available for use as purge fluids. Common gases for purged impulse lines include air, nitrogen, and carbon dioxide. 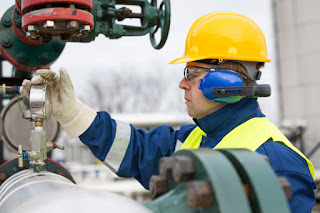 A purge system can be applied to both gas and liquid process systems. Share your process measurement challenges with instrumentation specialists. Combine your own process knowledge and experience with their product application expertise to develop effective solutions.